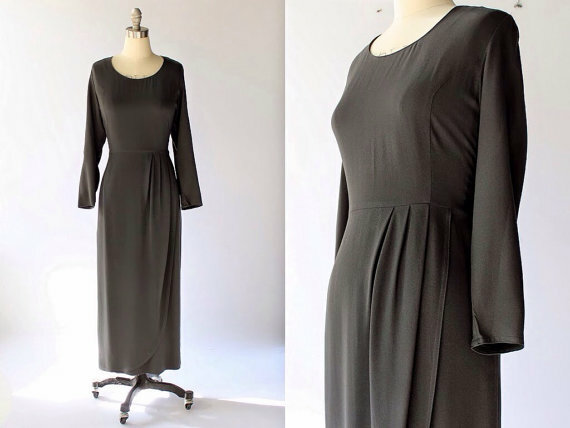 Vintage gray dress – and. Wow. And this, right here, is why I think vintage is the greatest. This dress is pure class. It’s wearable, the draping is uber flattering, it’s work appropriate *and* it can go out to dinner. And make you look good. I was originally looking for a gray dress so I could show you how cool it would be with the black diamond (gray) rhinestone connectors in my previous post here. But I don’t even need that excuse. This dress is going to look good no matter how you accessorize it – and think how many ways you could do that. Vivid scarf – great pumps. Leather boots. Spike heels. Rhinestones, pearls, glammed up – or toned down with wood cuffs or lucite. The color called “black diamond” is a neutral gray, always classy and attractive. And in this incarnation, these jewels are useful and versatile. Add a pearl or teardrop to the bottom ring and you’ve got an elegant pair of earrings. Or use them to connect your necklace chain to your focal jewel – or linked to make a chic bracelet chain. Useful, striking, sparkling. Just what you want your jewelry to be. Pair this sweet dress with my pink teardrop jewels (see previous post), and you’ll have a wonderful party outfit. The dress is a fab vintage find available from Vintage Life and Design and you are going to love this shop. Shelley, the owner, has a terrific eye for quality, affordable vintage items that real people can use. Go shopping, you’ll thank me! Because these glass jewels are beautiful – and easy to use – they appeal even to people who don’t have the patience for fussy detail work. And who like sparkly, feminine, classic jewelry. Because sometimes you want to get something gorgeous – and you haven’t got much time. 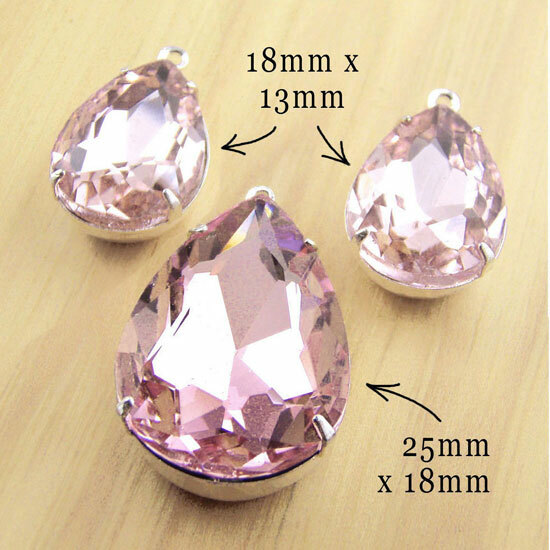 Grab this set of pink teardrop jewels. Add earwires: voila, you have pretty and feminine earrings. Get a silver chain, slip a jump ring and clasp on. Your necklace is simple – classic – gorgeous. You could wear it tomorrow with your new black tee and black jeans: instant work appropriate – and girly. You could wear it for your wedding. You could give it to your bride. *This* is the nice thing about DIY – without spending a lot of money ($6.99 for the set!) and with only a few minutes work, you just made something pretty and useful. And it’s done. And it’s easy. 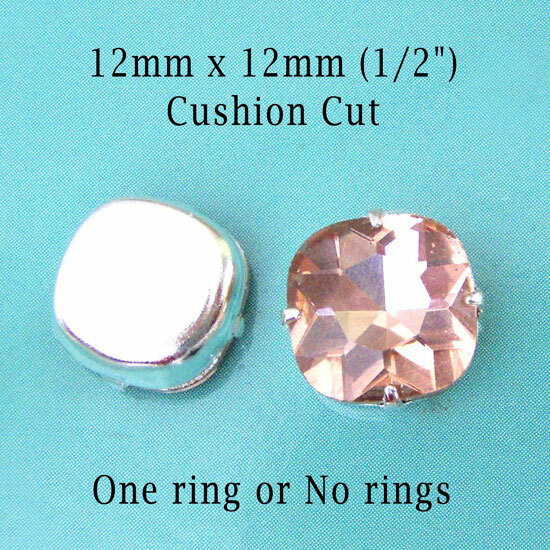 These peach “cushion cut” octagon glass jewels are new in my shop – and they are getting some wonderful attention. Girly? yes. Wearable? yes. And, well, they’re gorgeous. This faceted octagon cut just looks classy, whenever I see it – and I’ve been seeing it a lot of places. 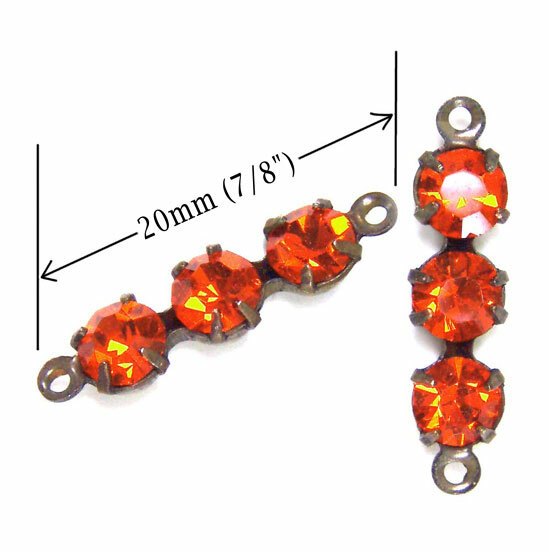 It’s a wonderful bridal jewel, it’s beautiful for party jewelry, and it’s also wearable for work – it’s not huge and dangling. It’s just a pretty, sparkly gem – okay, glass gem – that’s perfect for DIY earrings. Because, well, orange. Hyacinth orange, it’s called, and it is a gorgeous color, and sometimes you just want that vivid accent. The stones are tiny – 4mm, or about 1/8″. The whole connector is about 7/8″ long. Terrific for an earring dangle (add a pretty jewel to the tiny ring on the bottom, and your earrings are complete) – or link stones for a bracelet or necklace. Because sometimes, you want that vivid, lively, cheerful orange in your day! 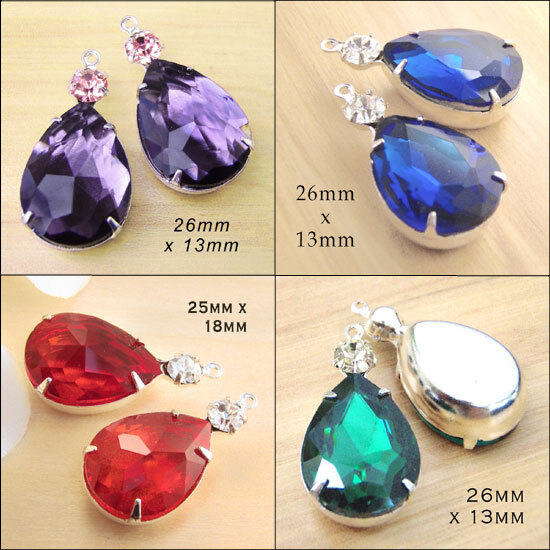 These are just some of the colors that are available – and the really fun part is that you can choose the color of those tiny rhinestones at the top. 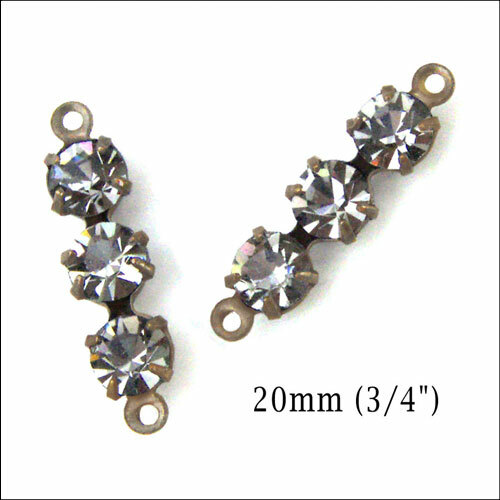 I show crystal (sparkly clear ones) mostly here – but you’ve got lots of choices, and there’s a drop-down menu on each listing so you can specify what color you want. 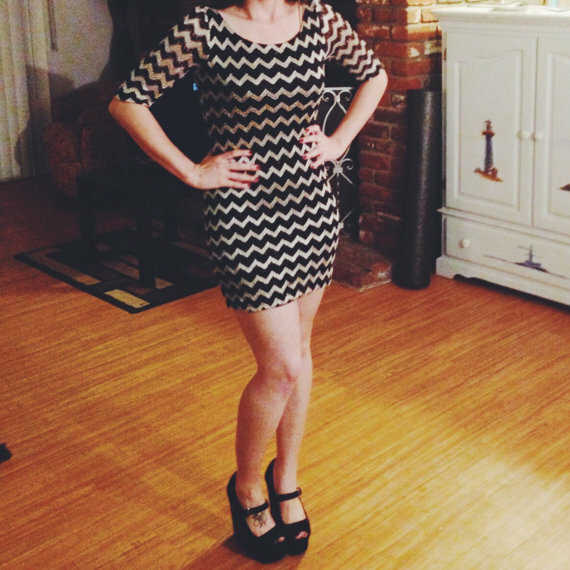 Of course I *am* going to say more, because I am really impressed with this dress – and with her additional pics. She shows great detail – and she shows that dress, how it moves and how it flatters. It’s available at Jabberwocky Vintage on Etsy. Go check out her other listings (and urge her to post more) – because she has a great eye! This is what a dress ought to be. Fun – flattering – affordable – and, well, look at it. Isn’t that how you want to feel when you grab your favorite dress?